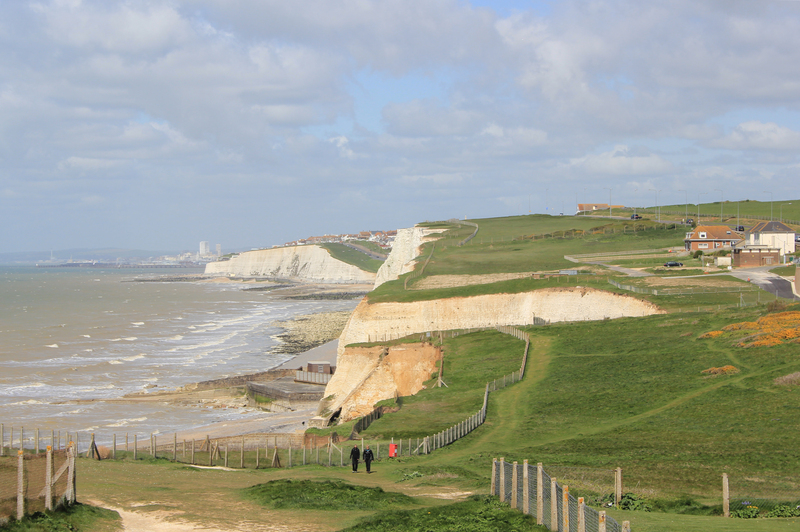 When we arrived back at Peacehaven for the start of today’s walk, we had a choice: up or down. “Up” would take us to the top of the cliffs and along a road which ran parallel with the cliff edge. “Down” would take us back to the promenade that we had so enjoyed last week. It was quite an easy decision, really – with weather like this how can you not walk along the bottom of the cliffs and stare up to see the white chalk contrast with the blue sky? 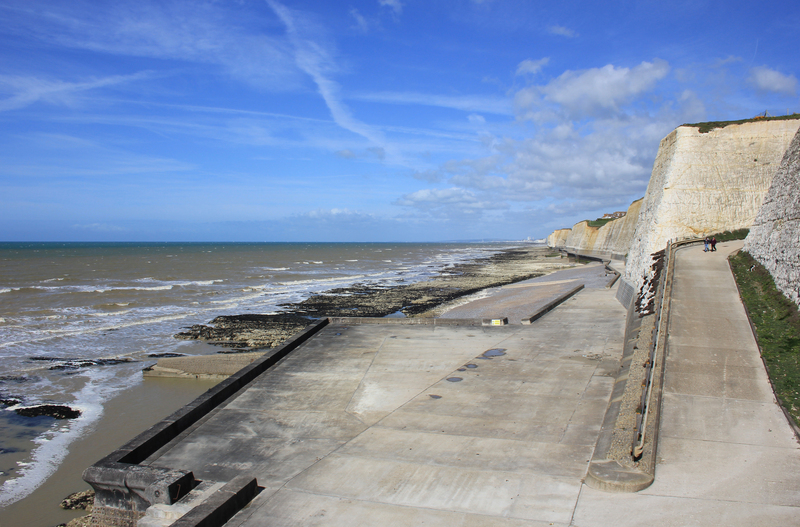 The proper name of this stretch of promenade is the Peacehaven and Telscombe Coastal Defences. These defences stretch over two miles, protecting those parts of Peacehaven which are built up behind the cliff edge. According to the Draft Coast Defence Strategy for this area, coastal erosion to the stretches of unprotected cliffs is estimated at between 10 and 30 metres over the next 50 years. That would put some buildings here at risk of falling into the sea, were it not for the defences. The one downside of taking the lower route was that we missed a monument marking the Prime Meridian. A short way into today’s walk we officially passed from East to West. We didn’t realise it until almost half a mile after the event. This was a pity. I would have liked to have marked the occasion, as we will not pass back from West to East for many, many years – not until we have walked through Wales, Scotland, and back down half of England again. The Prime Meridian does not, in fact, stand on longitude zero as measured with a modern GPS. GPS’s will measure the meridian as being some 100 metres east. This is because when the Prime Meridian was established in 1851, it was measured from the Earth’s surface in Greenwhich. GPS’s, on the other hand, will reference their meridian by measuring it from the centre of the Earth. The result is that the two meridians disagree with each other. 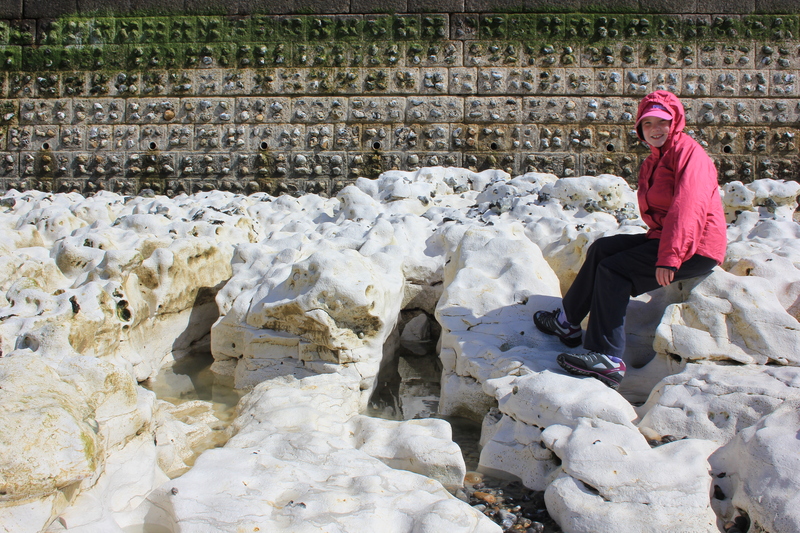 Although we missed the Prime Meridian monument by walking along the promenade, we did get to go down to the chalk platform below and observe the effect of the tide on it. Soon enough the promenade came to an end. We had to walk up a concrete slope, back to the clifftop, to continue. Here, with no coastal defences below, the extent of the erosion was clear. 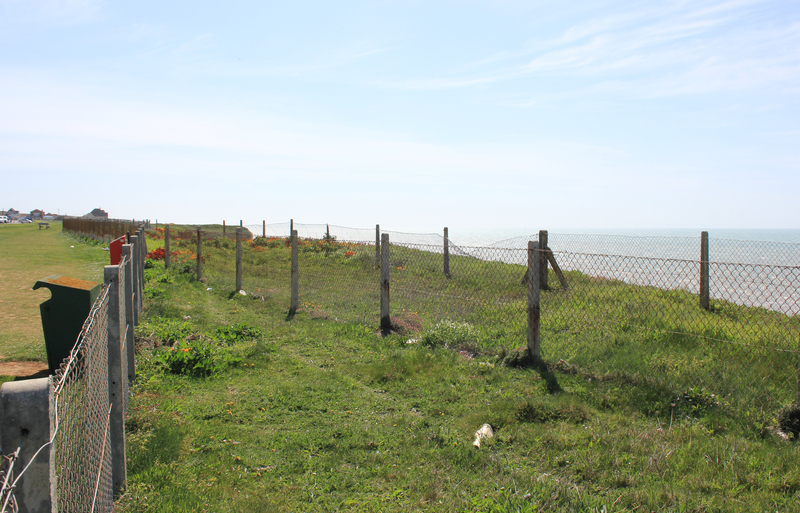 Fences had been erected to stop people getting too close to the edge of the cliffs, but in places these fences had simply disappeared. If these cliffs erode at a rate of 10 to 30 metres every 50 years, this means about a third to half a metre every year. Is is any wonder, then, that in some places there were up to three layers of fences, each replacing the last as the cliff edge advanced towards their lines? We were hemmed in! There were fences everywhere! As the cliffs made their slow but sure advance, the fences herded us out of the area. We continued on our way, towards Saltdean and on to Brighton, which we could see in the distance. 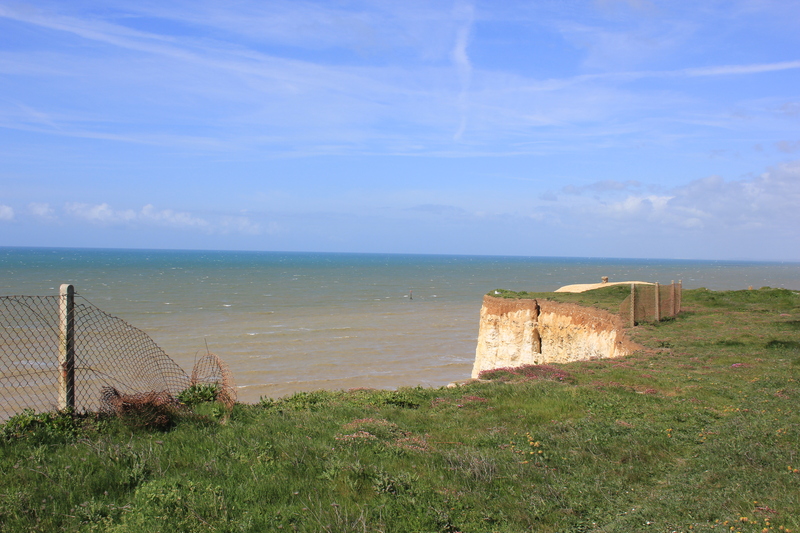 This entry was posted in East Sussex and tagged cliffs, coast, coastal erosion, East Sussex, erosion, GPS, meridian, prime meridian, sea defences, travel, walking. Bookmark the permalink. I never tire of these sights! I didn’t realize that coastal erosion was that fast – yikes! across it again to the north, right?